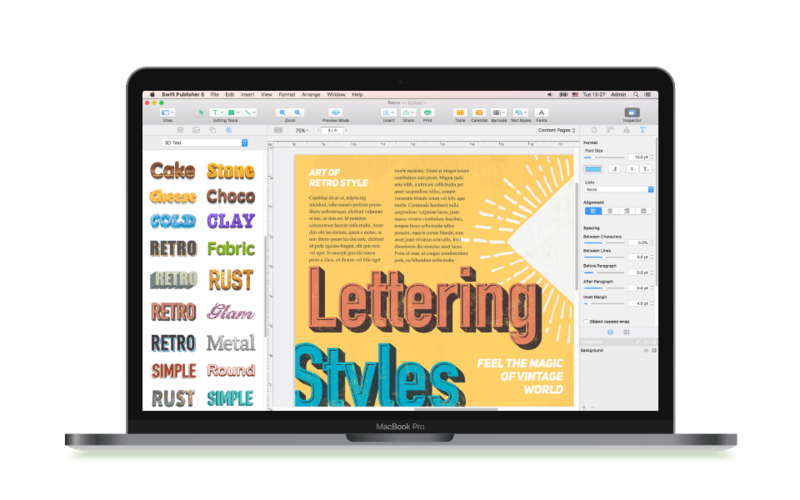 In Swift Publisher 5, you will be pleased to find many new layout and design tools, an enhanced interface, a collection of heading presets, new templates, improved program performance, and much more. Have a look at the “What’s New” video and the complete enhancements list below. Spread Mode lets you view and edit two pages on a sheet. It is useful when creating newsletters, magazines and all types of documents in which you can use common design elements on the spread. On startup, Swift Publisher 5 now prompts you to set up a new document: specify page or spread size, number of pages, select the units of measure and set the margins. Enhance the accuracy of your work by using a customizable grid and conveniently set the horizontal and vertical grid spacing. You can set the exact position of a guide by entering a value instead of dragging it manually (use Control+click on the guide). Picas support and a customizable grid make Swift Publisher 5 particularly convenient for working with forms. The program includes several widely used form templates that can be used as a starting point in creating your own form. Text box linking has evolved in Version 5 by allowing to link existing text boxes or break links between boxes. A collection of artistic heading presets guarantees that your documents stand out. Each and every heading preset was created by a professional designer who carefully selected the textures and shapes. Want more photos and images? Check out Depositphotos - one of the largest picture banks. More than 50 million pictures can be added into a document with just one click. Buy single pictures or get a subscription. For demo purposes, you can download pictures with a watermark right into Swift Publisher 5. Make sure that your clients can always find you. Include a street map with driving directions into your brochure or flyer. You can even add high resolution satellite imagery of your area for advanced navigation. New templates were added to be customized and used when needed, providing a quick solution for a small business or just a family reunion meeting. Sharing a document on Facebook and Twitter has never been easier. Swift Publisher 5 evolves the keyboard experience for those owning the MacBook Pro with Touch Bar. The user interface has become more stylish and intuitive! Check out the cutting edge icons on the toolbar and the new tabs in the Inspector. The inner architecture of Swift Publisher was redesigned to take full advantage of macOS High Sierra capabilities. The reworked engine significantly improves program performance allowing you to edit large, multi-page documents smoothly and efficiently. Layer management was moved to the Inspector, which is much more convenient than the drop down menu. Pixels are useful when working with web banners and social network images, while picas are widely used by designers and in typography. Free fields on the edges of the sheet are suitable for temporary placement of objects used in document creation. The units of measure can now be set individually for each document and stored within it, making working with multiple documents more convenient. You can now resize an object proportionally by dragging its corner handles with the Shift key pressed.